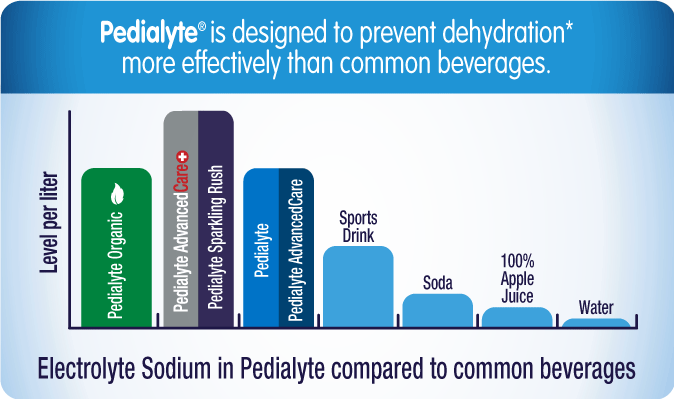 Pedialyte AdvancedCare Plus Powder Packs contain 33% more electrolytes* to replenish more of what you may lose when dehydration occurs. Convenient and portable, just add water and you’re ready to rehydrate and feel better fast! Pedialyte AdvancedCare Plus Powder Packs are our newest and most advanced way to rehydrate and feel better fast. Pedialyte AdvancedCare Plus is formulated to replenish more of the electrolytes you may lose due to vomiting, diarrhea, or extreme perspiration caused by excessive heat or prolonged exercise. Pedialyte AdvancedCare Plus also has PreActiv Prebiotics to help promote a healthy digestive system. * 60 mEq sodium electrolytes per liter vs 45 mEq in original Pedialyte. Anhydrous Dextrose, Short-Chain Fructooligosaccharides, Citric Acid, Salt, Potassium Citrate, Sodium Citrate, Natural & Artificial Flavor. Less than 2% of: Calcium Silicate, Acesulfame Potassium, Sucralose, and Blue 1.